Note: This electronic version of the report lacks appendices (apart from the Community Consultation and Cultural Profile Report) of the printed original. The above quick table of contents has been added, but the text of the document is otherwise unaltered. For background to the report and a quick overview, see the Dickson Precinct Community Group October 1998 Newsletter. The information contained in this document is solely for the use of the client identified on the cover sheet for the purpose for which it has been prepared and no representation is made or is to be made as being made to any third party. Maunsell has been commissioned to prepare a Master Plan for the development of the Group Centre, and later to undertake design of staged works for implementation of the Master Plan. The portion of Dickson Group Centre within the scope of this study is bounded by Antill Street, Northbourne Avenue, Majura Avenue and Phillip Avenue. Its location is shown in Figure 1.1. The brief describes the background to the project as follows. The Precinct Management program is a Government funded initiative which involves communities in managing their public places. It is recognised by the Government as providing benefits to group and local shopping centres where the strategy is being implemented. Precinct Management is now a formal component of City Operations (now Canberra Urban Parks and Places) public place management program which allows communities to be involved in identifying their priorities for public place upgrades. The objective of Precinct Management is to undertake a coordinated, participatory approach to public place management to reflect the differing needs and priorities of the community within the allocated budget provisions. The process actively involves the community and provides them with the necessary information and resources to make decisions about their own priorities. The Precinct Management process is coordinated by Canberra Places Section of City Operations Section (now the Precinct Management team, Canberra Urban Parks and Places) of the Department of Urban Services. The refurbishment of public places around older shopping centres involves the community in identifying issues and setting priorities which contribute to the Government’s ACT Retail Policy. Refurbishment of the Dickson Group Centre is a key part of the Government funded Precinct Management program. The major part of the shopping centre is paved and appears to be in reasonable condition. 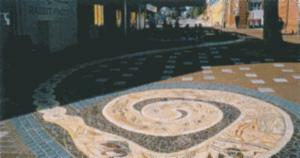 A major refurbishment of Woolley Street was undertaken and completed in December 1997. Shortcomings in the Dickson shopping centre include old, damaged and cluttered street facilities. The PCG acknowledges that improved waste management services within the Dickson precinct needs to be addressed in relation to receptacles style, placement and collection techniques. Canberra Urban Parks and Places, Precinct Management prepared a Functional Brief No CS/008/97 and engaged Totalcare Industries (now Totalcare Projects) to manage the project. encouraging attractive and landscaped public spaces and plazas. It comprises a number of elements including a shopping centre, garden centre, Tradesman’s club, health centre, post office, swimming pool, library, community centre, professional offices and service stations. The main shopping centre is a cluster of buildings bounded by carparks to the north and south, Badham Street to the west and Cowper Street to the east. Provision of a new drive through entrance to McDonalds from Dickson Place. The diversity of shops and services attracts significant patronage from both local residents, shoppers from north Canberra and office workers on Challis Street. Eastern approach via Cowper Street to the eastern carpark and via Dickson Place to the southern carpark. The path network at Dickson is extensive with typically concrete footpaths in road verges of variable width from 1.2m wide upwards. The condition of the paths varies with some areas needing attention. These areas are identified on drawing DGC/SK-01 in Appendix E.
The central area has been re-paved with segmental clay brick pavers and is generally in good condition. Some areas need attention adjacent to large trees where tree roots are deforming the pavement surface. There is one main cycle path that serves Dickson. This runs along the alignment of the floodway to the south of the centre. The main link with the centre occurs at the intersection of Cowper Street and Dickson Place with a signalised pedestrian crossing at Cowper Street. A narrow footbridge links the cyclepath to the swimming pool, tennis courts and community centre to the east. A 1.2 m wide concrete path links the cycleway to Cape Street along Challis Street to the west. A further link to the centre is proposed with the new Tradesman’s Club carpark. Residents of Downer must cross busy Antill Street. A dedicated signalised pedestrian crossing is provided midway between Cowper and Badham Street and also at the signalised intersection of Cowper and Antill Street to the east. No priority is provided for pedestrians at the intersection of Badham and Antill Streets to the west. Some workers from offices in Challis Street access the shopping centre via pathways along the Antill Street service road and Cape Street onto Badham Street. The majority via a central walkway between Blocks 22 and 24, Section 32, onto Woolley Street and across a pedestrian crossing on Badham Street adjacent to McDonalds. Cyclists and pedestrians from the south access the centre via the cycleway running in parallel with the floodway. To the east the cycleway links with footpath and a signalised pedestrian crossing across Cowper Street at its intersection with Dickson Place. To the west there is a path on Challis Street linking to Cape Street but there is no defined link between the cycleway and the shopping centre west of Challis Street. A link is to be established between the cyclepath and Badham Street in conjunction with the new Tradesman’s Club carpark development as there is currently no defined cyclist route linking the Tradesman’s Club to the main shopping area. Pedestrians from the eastern community centre, tennis courts and swimming pool are provided with a pedestrian crossing across Cowper Street near the Cowper Street bus terminus. Dickson Centre is the stopping point for bus routes 304, 305, 307, 308, 309, 364, 366, 367 and 432. The routes for these services to and from the Centre are shown in Figure 2.2. There is a large combined bus station and toilet amenity adjacent to the bus stop on Cowper Street. Dickson is well serviced by public transport. In the three main carparks there are approximately 516 spaces including 13 disabled bays. These are typically two hour time limited. Further spaces are provided on Cape Street, Woolley Street, Challis Street and also adjacent to the swimming pool. Parking surveys conducted for this draft Master plan showed that in the northern carpark 67% of people stayed for less than 30 minutes. In the eastern carpark 69% of people stayed for less than 30 minutes. By comparison in the southern carpark 46% of people stayed for less than 30 minutes. Results of the survey are shown in Table 2.1 below. The existing landscape throughout the Dickson shopping varies in both quality and extent. While good examples do exist, the overall landscape lacks cohesion. An example of this includes Antill Street which has oak trees planted along its northern edge and only sporadic planting of various species to the south. The same can be said of Badham Street which has large gaps within its street tree planting due mainly to businesses requiring exposure. The result is a street lacking consistent character. The condition of many of the open landscape areas is in decline with little upgrade work having been carried out in recent years. An example of this is the open grass area containing a range of flowering trees fronting Antill Street between Badham Street and Cowper Street. This forms the main address to the shopping centre itself, yet tree root growth is causing problems with the raised tree surrounds. While the problem does not present a real danger at present the situation will need to be addressed in the short to medium term. The other dominant landscape element within the centre is the trees located throughout the carparks. While making a valuable contribution, these trees are of variable quality and form due to lack of growing space and poor site conditions. An opportunity exists to partially improve this situation as part of the carpark rectification works. No deficiencies in services have been identified. Plans of these engineering services are provided at Appendix D as a consolidated services plan. The road pavements are generally in good condition with a few potholes and areas in poor condition on carparks and footpaths identified in Appendix E. The northern carpark and eastern carpark have recently been resealed and line marked. There are no playgrounds within the draft Master plan study area. The central shopping area consists of approximately nine separate buildings. The buildings are closely spaced and typically have eaves 2.5 to 3m wide, providing significant weather protection for pedestrians. This protection does not form a continuous link except between the post office and the library. Elsewhere gaps between eaves are generally only 2 to 3 metres wide. The area exposed to rain in windy conditions would be somewhat greater than this distance. Generally, there is no weather protection for pedestrians between the parking or drop off areas and building facades. Laneways and popular routes such as the shops to the toilet and bus station are uncovered. There are many large deciduous trees within the central area with seating surround which provide significant shade during hot summer weather. The three laneways off Dickson Place were unlit and have very low light levels. Other areas are identified as having excessive laterally spilled light such as the Tradesman’s Club flood lighting which help in lighting the carpark but also provides problems with glare. A copy of the lighting report prepared for this draft Master plan study is included as Appendix B. A collaborative community consultation process has been undertaken in identifying community needs, existing problem areas, reviewing options and developing the draft Master Plan. 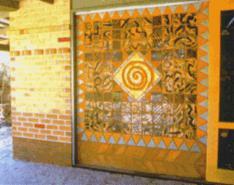 This has been facilitated through an established consultative group, the Dickson Precinct Community Group (DPCG) which was formed in November 1996. Dickson is currently growing in size. Recent developments include office building and apartments on Challis Street and construction of the Tradesman’s Club Hotel and carpark structure. Other redevelopment will continue. Some loss of custom is expected with the opening of the Gungahlin Town Centre. The centre is well utilised by a diverse community of all ages and backgrounds and is a focus for much of northern Canberra. An extensive programme of community consultation with an emphasis on cultural planning was undertaken by Susan Conroy. A copy of the cultural planing report is included as Appendix A. Ongoing liaison between the design team and Ms Conroy ensured that the proposed master plan was consistent with the findings of the cultural planning and community consultation. Originally the area was part of the native grasslands which were a dominant feature of the Limestone Plains. But the Dickson we know today presents a very different environment to 40 year ago when the area was a big open paddock apart from the CS and IR experiment station at Downer. In the consultations a number of people remembered being the first houses in their street in the Dickson area, that you could see all the way to Northbourne Avenue and that Antill Street marked the area "beyond civilisation". The shopping centre and the suburbs are a product of planning and design of the 1960s and 1970s. Dickson was established as a Group Centre under the ACT Territory Plan. The shopping centre has been described through the consultation process as being in three ‘disconnected’ bits. Whilst Badham and Cowper Street create the physical divisions in the shopping centre, each area feels quite different with a differing focus of activity occurring within each area. The three areas were variously described as the service area, the shopping centre and the recreation area. There were some mixed reactions as to whether people saw the community, recreation and entertainment activities to the east of Cowper Street as part of the shopping centre. However, generally people expressed the need to see this area drawn back into the shopping centre. The daytime population is boosted by a significant public service sector grouped in Challis Street particularly, as well as the student populations of Daramalan College and High School and Dickson College. The Year 11 and 12 students of Daramalan College advised that they are regular visitors to McDonalds. One of the strongest feelings to come through the consultation process was the sense that the Dickson Shopping Centre is changing. This is both in relation to the population base in the surrounding suburbs as well as in the retail activity. Whilst people reported that there is a perception of the shopping centre having an aged focus, the 1996 ABS data shows that the median age for the North Canberra Statistical Division as being 31. People regard the diversity of the population living in the suburbs around the Dickson Shopping Centre as an asset and to be encouraged. Through the consultation process there is a sense that it is time to bring in new shops. There has been some growth in computer services quite recently and a number of the consultations suggested that having monthly open air markets might make the place more lively and interesting. People living around the shopping centre are concerned that there will be a detrimental impact on the shopping centre if more cafes and restaurants open. Many people thought it would be a good idea to improve the library services by encouraging the use of spaces around the shopping centre for library programs. The courtyards also need to be improved. The library is involved in organising an annual Christmas Carols event and participated in this year’s Multicultural Festival by holding story telling in the area in front of the library. The problem for the library is that the area directly in front of it is very hot in summer with little shade or shelter and is blasted by cold winds in winter. A range of other agencies are involved in the cultural and community life of the area. The Majura Community Centre provides a venue for a range of activities including study circles associated with the University of the Third Age and social dances. Some of the community service providers occasionally involve their client groups in arts and cultural activity. The colleges need to be recognised for their potential for contributing to the cultural and community life of the area. Students from Daramalan College studying art and/or graphic design expressed an interest in being involved in community arts projects. An example might be Megalo Access Arts and the College(s) working together for banner design and production as part of a festival or other local event. 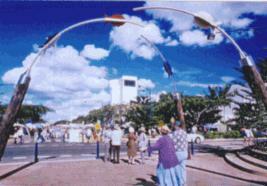 There were mixed feelings about the buskers especially in relation to quality, however they were also seen as being a unique part of the cultural life of the Dickson shopping centre and to be encouraged in the design process. In the consultation process, despite the difficulty people occasionally experienced in identifying it character and attributes some elements of the cultural life of the area have been identified. Dickson is a colourful place with a diverse community. There is a history associated with the airstrip, the CS and IR experiment station at Downer and the sheep paddocks which were once associated with Duntroon. The final section of the cultural planning report briefly discusses a number of issues that emerged from the consultation process. While the issues raised are not essential to a public place refurbishment project, they have social and economic implications and are included in this document for consideration by the business community of Dickson. As noted previously, a number of the consultations suggested that Dickson is a shopping centre with a focus on an aged community. Young people are not seeing the Dickson shopping centre as an area for them and without fail they all cited that they went to Belconnen or Civic. "Dickson is boring!" There are 350 Year 11 and 12 students at Daramalan College alone and the Youth Centre is visited by 20 to 30 young people daily. There was 630 young people between the ages of 0 to 24 recorded in the 1996 census for Dickson local statistical area. Through the consultation process quite a strong dislike of the Dickson shopping centre was expressed and there are obviously people who choose to go to local shopping centres in the surrounding suburbs rather than go to the Dickson shopping centre. It would appear that while peoples needs are met for shopping and professional services from Dickson there is a general lack of satisfaction from residents and shoppers. There is a perception that the businesses are not really trying. In conclusion, the cultural life and character of the Dickson shopping centre is formed by its location, its role as a district level commercial centre and by the residents and visitors who go there. Simultaneously there is a perception of Dickson as the ‘local shops’ and yet the consultations and research reinforce the importance of the shopping centre at a district level for North Canberra. Traffic circulation is one of the key issues at the centre. Vehicles travel at speeds which are perceived to be too high for the environment. The layout of the carparks and access roads provides much conflict between vehicles and pedestrians. Turning areas are too narrow in some places and parking areas are often too congested. Lack of pedestrian lighting for the centre and associated carparks. The layout of the centre results in pedestrians crossing busy circulations roads to the northern and eastern carparks and across the busy through traffic route (Dickson Place) adjacent to the southern carpark. The orientation of the parking aisles is to the preferred direction, however there are significant conflicts along the northern edge of the development, adjacent Woolworths. Elderly people from the health centre and Dickson Park also experience difficulty in crossing the road north of the library. There is a significant pedestrian movement across Badham Street from the western sector uncatered for which has high traffic volume. Disable bays locations should be reviewed adjacent to the library. Review time limits for parking is appropriate. The centre has poor connectivity as numerous precincts separated by Badham Street and Cowper Street. These precincts are not integrated and they appear to operate as discrete elements. The connection to the health centre to the north and the Tradesman’s club to the south are also poorly defined. Access points to the centre are uninviting, with unattractive brick walls with unwanted posters and graffiti. Particular areas of concern are the laneways and Dickson Place. External signage is poor and internal directional signage is non existent. There is a lack of active communal space suitable for gatherings, events or passive use. As Dickson has a higher demographic proportion of aged persons than newer areas of Canberra, more disabled bays should be installed. The southern carpark currently has no disabled bays. Cars overhanging the footpath on Challis Street opposite the Motor Registry prevent footpath access. Ten recommendations were made on kerb ramp modifications and are detailed in the report. Ramps are missing or in the wrong places, with many of the ramps having a lip at the road edge (undesirable). The footpaths exhibit numerous problems including uneven surfaces and surface level changes, presence of obstacles, cars overhanging the footpaths, footpath discontinuity and gravel path untrafficable by wheelchairs. Colour and background of Woolley Street crossings provide poor distinction for visibly impaired people. Lack of edge surrounds is a problem for the vision impaired. Exposed tree roots provide uneven surface and trip hazards. Log barriers provide trip hazards for visually impaired. Bollards on Cape Street are of poor colour contrast for the vision impaired which makes their detection difficult. Bollards in Woolley Street are of good colour contrast. There are no playgrounds in Dickson Group Centre. Advertising boards and other obstructions should be clear of continuous pathways and full height. 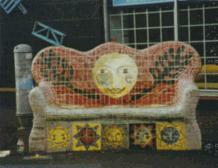 Many seats did not have distinctive colours, arm rests, back support and seating level too high. Rubbish bins should be full height and distinctive colours. Bike racks were of poor colour distinction. Numbers of poles should be reduced wherever possible with location clear of pathway. Distance to toilets is too far from western end of shopping area. The disabled toilet is not signed outside the toilet block. It is noted in the report that Woolley Street now hosts a number of features that are consistent with good design for people with disabilities. There is no consistency or concept in the existing landscape treatment. A green space is desirable in the central shopping centre. 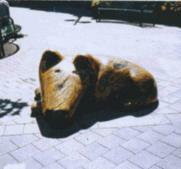 Public art would enhance the community spirit of the centre, as would areas set aside for performers. There is a lack of verge trees which would strengthen the landscape character of the area. The quality, location and design of street furniture is poor and appears dated. Planter boxes are lifting and breaking due to tree root pressure and some species are unsuitable for the continued courtyard locations. The pedestrian pavements throughout the central courtyards have a generally acceptable appearance. Paving along Badham and Cape Streets, north of Woolworths and surrounding the library has poor aesthetic qualities. Address traffic problems on Badham Street and the northern carpark as well as McDonalds entrance access and egress. These issues were discussed with representatives of the PCG and the resulting draft Master Plan reflects the PCG’s views on their desires for development. The following describes the significant components of the Master Plan which is included as Section 5 of this report. The proposed traffic management measures are complementary to and draw on the earlier Ainslie - Dickson traffic study. The existing carpark layout is shown in Figure 4.1. Traffic studies revealed that the majority of shoppers in the northern carpark stay less than 30 minutes. This results in significant activity and congestion in the carpark. As shoppers desire the closest park to the centre, congestion and traffic volume is particularly high towards the south east corner which is the main access point to the centre. Vehicular and pedestrian conflict is particularly prominent in this location. The perimeter road on the southern and eastern edges of the carpark have unnecessarily high volumes of traffic including through traffic, pickup and set down and circulating traffic looking for parking. The proposed attempts to reduce the volume of traffic on the perimeter road by diverting traffic into the central parking area. A one way angle parking system is proposed which will streamline traffic flow within the carpark. Raised pedestrian pathways are proposed along the southern perimeter to assist pedestrian movement within the carpark. This arrangement will reduce the number of parking spaces from 246 spaces to 201 spaces. There would be significant reduction to the amount of spaces lost if right angled parking was maintained, however this would be less desirable. The proposed layout is shown in Figure 4.2. The existing southern carpark layout is shown in Figure 4.1. Access to the carpark is via multiple entrances along Dickson Place. Dickson Place acts as a through route between Cowper Street and Antill Street, providing access to loading docks for the central shopping area and access to the carpark. Traffic volumes are high on this road and loading of vehicles causes much congestion. Dickson Place was generally considered unsatisfactory for pedestrians and servicing of the shopping centre. The carpark is oriented with aisles perpendicular to the short width of the carpark. This results in a significantly inefficient carpark with awkward turning manoeuvres and congestion. It is proposed to provide an entrance to the carpark off Badham Street and reorientate the parking aisles. This provides approximately 20 additional parking spaces and reduces traffic volumes and congestion on Dickson Place which pedestrians must cross. A raised pedestrian walkway is proposed through the centre of the carpark. This will provide a clearly defined path for shoppers leading them to the laneway, and provide connectivity between the shopping centre carpark and the Tradesman’s Club. Pedestrian crossings across Dickson Place are proposed in alignment with the laneways. Removal of the pedestrian refuges and replacement with kerb protuberances will provide for improved manoeuvrability within Dickson Place for commercial vehicles. The proposed layout is shown in Figure 4.2. The layout of the existing carpark is shown in Figure 4.1. The current orientation of the carpark is good for pedestrian movements. However, the southern end of the carpark protrudes into the central shopping area, breaking the desired link between the library, the toilets, bus stop and pedestrian crossing on Cowper Street. To improve the connectivity of the area and provide much wanted public open space, it is proposed to cut back the carpark at the southern end and provide right angle parking along the southern perimeter. This results in the loss of approximately 12 spaces. This proposal is shown in Figure 4.2. Pedestrian thresholds are also proposed between the library and the health centre and the church and Dickson Place on the northern circulation road to provide connectivity between the areas and reduce traffic speeds. It is proposed to convert the cyclepath signals to full intersection traffic signals in order to reduce confusion and to also reduce traffic congestion within Dickson Place. This will allow a signalised pedestrian crossing of Dickson Place. This measure is consistent with the outcomes from the Ainslie Dickson Traffic Study. The congestion at the entry from Antill Street to Badham Street could be alleviated by a signalised median opening midway between Badham and Cowper Streets. Whilst this is a desirable access, the number of visitors to Dickson is likely to have changed following the opening of the Gungahlin Town Centre. The level of congestion at this intersection may also have reduced with the expected lower traffic volumes and it is therefore recommended that the proposed median opening be deferred until traffic patterns stabilise after the opening of the Gungahlin Town Centre. Additional pedestrian crossings or traffic islands are proposed at the following locations where there are heavy pedestrian movements. Badham Street midway between Woolley Street and Dickson Place. A raised road hump crossing or wombat crossing is proposed to replace the existing crossing on Cowper Street adjacent to the bus stop. The road hump will assist in reducing travel speeds at the crossing and will provide better connection between the shopping centre and the swimming pool. The existing bridge spanning the floodway north of Cowper Street is neither wide enough for two-way movement nor suitable for cyclists en route to the swimming pool or community centre. Upgrading the bridge provides an opportunity for a more direct route for cyclists and pedestrians to the proposed signalised intersection of Cowper Street and Dickson Place. The Landscape proposals are presented on both the overall draft Master Plan and at a more detailed level on the central area enlargement (Appendix A). The landscape proposals at the Masterplan level aim to build on the existing landscape qualities of the area with particular reference to improving the overall quality of the streetscapes by establishing a consistent and legible landscape theme. The following key points outline the proposed strategy to achieve this. Additional street tree planting to the median and southern side of Antill Street to strengthen its visual quality. To achieve this the current overhead powerlines would need to be placed underground . Substantial upgrading of the landscape to the edge of the main shopping centre facing onto Antill Street between Badham Street and Cowper Street. This would include a major artwork / entrance installation at the intersection of Antill Street and Badham Street to announce the presence to Dickson Group Centre. Add new street tree planting to Badham Street to replace recently planted trees which are of an inappropriate scale. Strengthen planting in Cape Street to continue the character established in recent upgrade works carried out adjacent to PALM. Upgrade edge to Library via new pavements and addition of tree planting. Remove existing shrub planting on verge in front of Tradesman’s Club along Badham Street edge to improve pedestrian / cycle movements. Redesign existing landscape area along Cowper Street frontage in the vicinity of the bus stop to improve appearance and pedestrian flow. Introduce street tree planting to Dickson Place where possible keeping in mind the heavy usage by delivery vehicles. The detail plan outlines the proposal to enliven the internal paved spaces throughout the shopping centre by developing a design character unique to Dickson. As part of this strategy the following key points have been included. Extension of the pedestrian pavement into the carpark to the east of the Library. This is aimed at improving the connection to the Swimming Pool / Community Centre edge of the centre as well as providing for additional recreation space . It is proposed to create a new green space and play space within this area as well as provide for a new public toilet facility to replace the toilets as the bus stop. Create a new focal point for the centre by rebuilding the square in front of the Library incorporating a performance stage, overhead canopy structure, new pavement works featuring artworks and new furniture. Include within the space relocated telephones and community notice board. Replace the existing raised square brick tree surrounds with a more organic form made from reinforced concrete with artwork inlays to add interest to the different courts. Add new furniture throughout the centre including seating, bins and bicycle stands. Provide upgraded pedestrian lighting throughout. Introduce a range of artworks treatments to relieve blank walls both within the Centre and around its edges. Upgrade pedestrian connections to all surrounding carpark areas. Install signage / direction markers at major pedestrian entrance points. At the end of this section are examples of artworks implemented elsewhere which are typical of the range of works being envisaged for Dickson (Figures 4.3 and 4.4). The exact form and nature of the final artworks would be developed at a later stage . Also included are examples of the style of furniture and pedestrian lighting proposed at this stage (Figure 4.5). An entry feature corner of Antill and Badham Streets. Vertical element with movement and colour. Sculptural forms integrated with soft landscape treatments. Might play on theme aircraft. An major pavement feature. Abstract or realistic. Mapping elements of the Dickson community and environs. A child’s play area. Sculptural forms which encourage play. Exploration social interaction. Signage can have unique design features. Pavement motifs. Motifs provide a visual cue and recurring theme throughout the shopping centre. Icon developed from feature in the landscape. 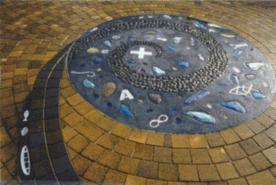 Provide a template which can be etched onto pavement surfaces. Tree surrounds. Ceramic wood and/or metal. Images can be realistic or abstract. Playful/whimsical. Provide colour/information. Community project where artists works with a variety of groups to develop images. Public furniture. 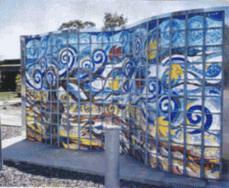 Artist engaged to develop functional public amenities such as seating, signage, bubblers, grates which are unique distinctive elements. Conditional options for wall treatment on support funding by others. Can be permanent or temporary. Images can be realistic or abstract, decorative. Walls might be rendered, painted, mosaic, sculptured etc. An assessment of the current lighting was undertaken by Lindquist Johnson Pty Ltd (see Appendix B). Installation of new medium height lighting system to northern, southern and eastern carparks and associated roadways. Removal of floodlights from Tradesman’s Club. Installation of aesthetically high quality lighting system to central courtyard areas. Installation of wall mounted (or other) lighting system to laneways off Dickson Place. Lighting to cyclepath from Challis Street to Cowper Street. Co-ordination and modification of shop front lighting to assist in lighting central shopping area. Note: All lighting should be to AS 1158.1 or better and also to AS 4282. Integral with opening up a spine and central public space between the library and the swimming pool is the proposed demolition of the combined bus station and toilet block. A smaller shelter is proposed at the same location with a toilet and change facility for exclusive use of bus drivers. New public toilets are proposed to be located more central to the shopping are adjacent the post office. "Exeloo" type installation are recommended. It is proposed that an existing building housing the ACTEW substation on the corner of Cowper and Dickson Place be demolished to open up the area as a local entrance point to the centre. Pad mounted transformers could replace the existing infrastructure. There is potentially a prohibitive cost associated with this proposal. Options for treatment in the area follow. The following drawings are reduced scale copies of the Draft Master Plan and supporting display material. Some alternative landscape proposals are shown to address the landscape in the vicinity of the ACTEW substation. Description of the major elements of the Master Plan has been provided in Section 4. Comments and corrections to Tom Worthington. Note: This information is no longer being updated but has been retained for reference.